Intex air mattresses stand in a category of their own. What we mean by that is they are a solution for a certain group of people – people who need an blow up mattress that will do the job without breaking the bank. If you take a minute to look at the ratings and comparisons, they stand tall even compared to some of the best air mattresses out there. That’s especially true for one model – the Comfort Durabeam which is currently in the TOP 3 overall, mostly because of the quality-to-price ratio. This bed incorporates technologies that you don’t usually see in this price range. Trademark technology that uses enhanced fibers instead of regular PVC for internal beam separation. But, let’s take a step back and look at the ratings of the 3 Intex airbeds that were the top choices in our latest update of the reviews. 2 What’s new in the reviews? *(spoiler alert: none of the Coleman or Aerobeds are as highly-rated as the Intex Comfort Durabeam). What’s new in the reviews? As far as the order of the models is concerned, not a thing! The table positions are the same as we left them two months ago. If you’ve ever followed a single article arc on 3Beds, you know by now that we never leave our faithful readers to hang and dry. We’ve been very busy over the past two months gathering extra info from recent buyers and doing additional tests on all of the models showcased here. We’re in constant contact with buyers all around the world, searching to hear their feedback on the air mattress they’ve just bought. We had E-mail correspondence with more than a hundred recent customers, and we gathered a ton of useful hands-on experiences, both positive and negative. If you read us regularly, you know we test EVERY SINGLE air bed we write about. The models we’re talking about today are no exception. We’ve conducted a slurry of experiments, each more daunting than the next, and we’ll share some of the most important results with you today. We’ll hear more about those during the individual reviews of Intex airbeds that “made the cut”. With that little bit out of the way, it’s time to “burn some rubber”. Comfort Series is the premium product line from Intex. It features their staple price-to-quality ratio, and it’s always a ton of fun to review. All the intricate maneuvers the manufacturer had to go through to create a 60-dollar bed that would compete on-par with the bigs are a real threat for us mattress “maniacs”. It’s so easy to inflate and set up, we can have it out and ready for our visitors in a matter of minutes! With some sheets over it, it looks just like the bed in our bedroom. Our guests can’t even tell the difference until they examine it more closely. Works great for our small bedroom or when we have guest over. I really like the fact that it’s flocked all over. It just feels like one big velvety cloud wherever you touch it. The waterproof surface is a huge load off since I can’t even begin telling you how many spilling accidents I’ve had over the years. So, if you’re a klutz with your drinks like me, this is definitely a way to go! I’ve spent two months sleeping on this bad boy during my back surgery recovery period. I’ll just say it played a HUGE part in my overall recovery, as it kept me nice and comfortable during whole that time. The support it gave me was crucial, and I felt my back being straight as an arrow and my spine aligned to perfection. If you have back problems like I did, this bed is a gift made in Heaven! Considering the price, I expected this bed to be a one-time sleeping solution for our camping trip. I figured it’ll get punctured along the way or simply deflate every single night. None of those two turned out to be true, however! It holds air like crazy, and seems to be quite resistant to prickly things as well. We’ve inflated it the first night we got to our campsite, and it held air perfectly for three nights in a row! As we said already, the main thing this model has to offer (as any other Intex product) is a great ratio between the quality offered and the money demanded. This Intex is hardy a high-end luxury air mattress, but it’s by far the best in it’s price range. Comfort Series goes one step beyond all other Intex products by offering some pretty interesting technologies along the way such as Fiber-Tech Construction and Dura-Beam Technology, for example. What are these technologies exactly? In case you missed it, let’s reiterate. Fiber-Tech is a name for the huge quantum of super-strong vinyl fibers stretching between the top and the bottom of the bed, increasing its structural stability and overall durability. They also reduce the wobbling of the surface and prevent bulges and holes from forming at the top.We’ve tested the strength of these fibers, and they are insanely sturdy, so they’ll handle anything you can throw on this mattress. The strength of the fibers also prevents them from stretching after a while of heavy-duty use. Dura-Beam is the name of technology used for “air packing” inside the mattress. You probably know by now that we prefer to see chambered designs, but we’re still talking about 60-dollar price tag here, so some corners had to be cut eventually. Instead of “storing” air in separate internal chambers, we have “beams” that stretch from one end of the bed to the other. It wouldn’t be the most firm solution if it weren’t for the Fiber-Tech. Once we add the insanely strong fibers to the mix, we hit the jack pot! So, we have a design that’s the closest thing to separate chambers without the actual chambers, which is a real pearl of creativity and clever design if you ask us. If the budget is tight and you still need a good-quality air mattress for camping or home use, this model is your best bet currently on the market. It’s a product that goes way beyond the money you’ll have to pay for it in both comfort and durability. It features some innovative and good technologies, which complement each other perfectly, so it’s no wonder the overall score for this inflatable bed is 87/100. For a 60-dollar mattress, this is an unprecedented success. This is one comfortable air mattress! I couldn’t believe something this cheap can sleep this great! I bought it to sleep at my son’s apartment when I go visiting, and it’s almost as comfortable as my regular bed back home. Great buy! I’m definitely not a small guy, and it holds me without any problems. I’m a pretty restless sleeper to match, so I’m a real handful for my beds, but this one doesn’t seem to mind. I even took it camping, even though Intex doesn’t recommend it and it performed like a boss! This model lies somewhere in-between Comfort Series and Intex Classic Downy. It’s one of the cheapest models they have that features some impressive technologies for the price. The price tag goes around 35 dollars, which is affordable no matter how limited your budget is. It’s a product made in Heaven for all of us who don’t like overly high blow up beds, as the height of 18 inches definitely found its target group among the customers we’ve been in contact with. The construction is surprisingly sturdy, as show during our pressure and tensile tests. The internal air holding design is comprised of vinyl beams, similarly to Comfort Series. The pump is quite powerful and quick to inflate and deflate, and it passed our “hundred inflations/deflations” test with flying colors. Some of the customers didn’t like the pillow rest, but they’ve solved the problem easily by switching to the other side of the bed. When we take the price into consideration, this model offers way more than we have to pay for it. Let’s face it, we can’t expect much for the low buck, but Intex just keeps on surprising us. If you’re not willing to spend a ton of cash on your guest/camping bed, but you still want a decent product, this is definitely the way to go. It’s a superior product to Intex Classic Downy, and under the Comfort Series, which we already marked as the pinnacle of Intex inflatables. We know they say it’s not really designed for outdoors use, but when has that ever stopped us from dragging it over to our favorite campsite? The valve foe quick deflation is simply a great addition and very easy to use. I thought the cap might pop off when we pilled 400 lbs on top of this bed, but it didn’t, so I have only one thing to say about the whole experience: FREAKING AWESOME!!! 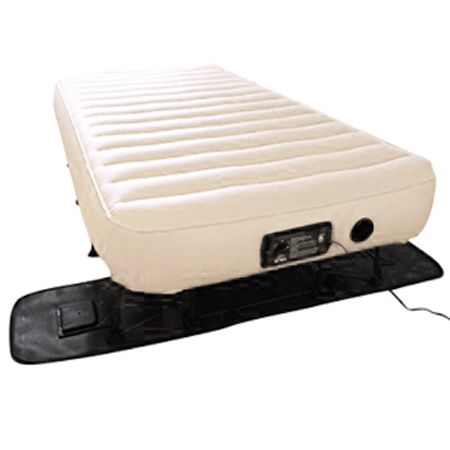 One of the few airbeds on the market that can be used both as low or high-rise. When separated, it comfortably sleeps up to 4 people. Let’s get the biggest “problem” out of the way first, shall we? It doesn’t have a built-in electric pump. That being said, this is one of the most interesting and versatile models we’ve seen in a long time. The absence of the pump means we’ll have to get an external electric or manual one, which shouldn’t be too much of a hassle. An electric pump would definitely increase the price, so it was the most logical corner to cut. This model is envisioned as an extremely versatile and sturdy air mattress made for both in-house and use outdoors. Even the manufacturer states it can be used for camping this time around, which means they’ve armed it with some pretty heavy-duty materials (as stated in the specification). Bottom line, we have one blow up bed that can turn into two and accommodate up to four people comfortably; more if you don’t mind space economy. It’s very sturdy, doesn’t lose air throughout the night and it’s beyond affordable. If all this sounds like something you might need for either home use or camping, you can go for it without ever looking back. 3Beds seal of approval is officially there. This update on the best Intex air mattress guide was the result of two months of hard work on information gathering, cut with a slew of tests of our own. We hope you got all the necessary info you needed to make the right choice and add a dose of comfort to your bedroom, guest room or camping tent. We’ll come back with a fresh update in two months, and we have no doubt there will be a ton of new useful info for you to read. We might even see some changes among our winners, you never know. Sleep tight and see ya in the next update.